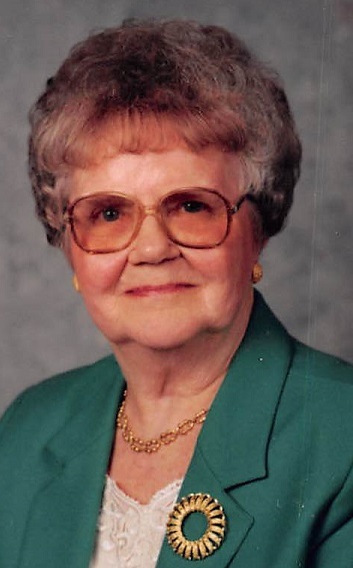 Obituary for Ilene M (Rau) Williamson | Schaffer Funeral Home, Inc.
Ilene M. Williamson, 93, of Defiance, passed away on Monday, June 25, 2018, surrounded by her family at the CHP Defiance Area Hospice Inpatient Center, Defiance, OH. She was born on August 1, 1924 to Harley and LaDonna (Sheeks) Rau in Oakwood, OH. In 1946 Ilene married Vincent R. Williamson Sr, who preceded her in death in 1985. Ilene worked in the Cafeteria for Defiance City Schools, and for Defiance Milk Products. She was a member of St. Paul's United Methodist Church, and Order of Eastern Star #321. Ilene's life centered around her children and all grandchildren. She was a wonderful cook who loved making pies and cookies for friends and neighbors. Ilene is survived by her son, Vincent (Billie) Williamson, Jr. of Fort Wayne, IN, daughters, Vicki Lantz of Oakwood, Ohio, Julie (Raul) Sanchez of Defiance, OH, brother, Cleo (Betty) Rau of Millbury, OH, Step-Daughters, Janice Steffel of Jewell, OH, and Nancy Burton of Battle Creek, MI, 5 Grandchildren, 8 Great Grandchildren, and 6 Great Great Grandchildren. She was preceded in death by her parents, husband, Vincent Williamson, Sr., brothers, Gareld Rau, and Richard Rau, sisters, Marie Graham, Audrie Brueshaver, Hilda Wentworth, Step-daughter, Mary Harpine, and Son-in-law, Gary Lantz. Funeral services will be held on Saturday, June 30, 2018, 11:00 am at the Schaffer Funeral Home, with Deacon Jeff Mayer, officiating. Friends may begin arriving at 10:30 am. Memorials are suggested to the CHP Paulding County Hospice or CHP Defiance Area Inpatient Hospice Center . Online condolences can be given at www.Schafferfh.com.